All iiyama G-Master™ monitors support FreeSync™ technology ensuring fluid and fracture free gameplay. Each monitor offers also access to predefined and custom gaming modes to quickly adjust settings to your own preferences. The Black Tuner functionality allows gamers to adjust brightness and dark shades improving viewing performance in shadowed areas, and the Blue Light Reducer function substantially limits the amount of blue light emitted by the screen, which means your eyes will feel less fatigue even if you spend long hours playing your favourite game. Red Eagle – the highest positioned clan – featuring 1ms response time with 144Hz refresh rate, making it the ultimate choice for pro-gamers, is now available also in WQHD (2560 x 1440) resolution. The 27’’ “join the pro-squad” G-Master GB2760QSU offers 77% more on-screen space than a standard 1920x1080 Full HD monitor. 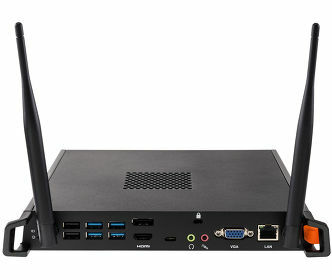 Triple input setup (DVI, HDMI, DisplayPort), speakers, headphone connector and a 3.0 USB hub are all included. Users with budget constrains should check out the two new Black Hawks. 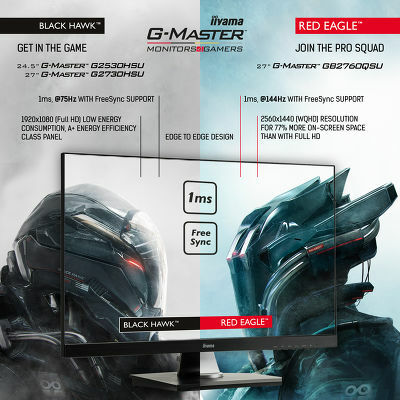 The 24.5’’ G-Master G2530HSU and its big brother in arms – the 27’’ G-Master G2730HSU, introduced as the “get in the game” monitors offer Full HD resolution, 1ms response time and 75Hz refresh rate. The new Black Hawks also feature triple input support (VGA, HDMI, DisplayPort), speakers, headphone connector and a USB hub (2.0). Design-wise all three monitors present an elegant edge-to-edge look which on the practical side means they are most suited for building multi-monitor gaming setups. The G-Master G2530HSU and G-Master G2730HSU Black Hawk monitors belong to the A+ energy efficiency class, making them truly environmental friendly products. 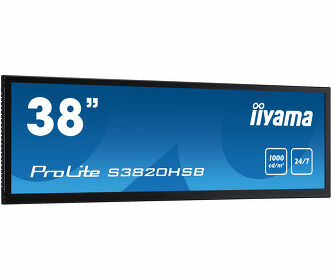 For more details visit the iiyama G-MASTER™ dedicated website at gmaster.iiyama.com.